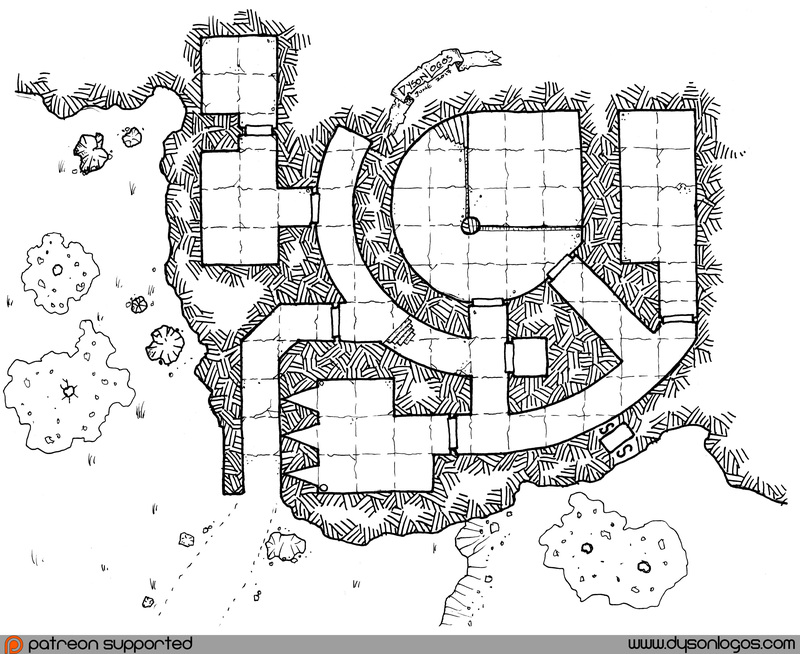 Built into a stony hillside, this small dungeon was originally constructed as a storehouse for important, magical, and often illicit goods. The strong defensive construction made it a prime fortress and hideaway when the crown was being contested and became the secret home to the treacherous Prince Kalway. In the end it took a skilled assassin, some magical assistance, and a fairly large deposit of gold to pull the prince out of the structure alive to be tried for his crimes. The structure is still used by the merchants of House Pirret as a valuable goods storehouse, but it has forever been rebranded as “the Coward’s Crescent”. I drew this particular map at a different scale than usual. Normally I work on 5 square per inch graph paper and draw with a general intention of 10′ per square (or 50′ per inch). For the Coward’s Crescent, I went with 4 square per inch paper, and drew at 10′ per 2 squares (well, 5′ per square on the graph paper, but when inked I kept to the 10′ squares). I actually found it difficult to draw at this scale – not because of the extra detail, but just having to constantly watch over my scale and square placement instead of just letting my pens draw as they want. I never realised you drew at 10 ft. per square. I automatically presumed 5 ft. per square for some reason. It’s the traditional scale for classic D&D, which is my game of choice. Yeah, with hindsight it’s obvious but I’d forgotten that that was the traditional scale.